Alternative health sites have claimed that five (or six) "holistic health doctors" died under suspicious circumstances in 2015, but the assertion didn't hold up to closer scrutiny. 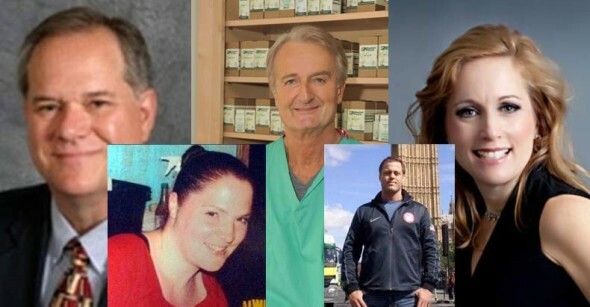 NEWS: Alternative health sites have claimed that five (or six) "holistic health doctors" died under suspicious circumstances in June and July 2015. In mid-July 2015, a number of articles on the subject of recently deceased alternative health practitioners began to circulate on social media. One of those (articles ("5 Holistic Health Doctors Found Dead In 4 Weeks, 5 More Go Missing — After Run-Ins with Feds") appeared to have inspired several other similar articles, but the claims they made were mostly congruent. June 19th, 2015 – Dr Bradstreet ... was found with a gunshot wound to his chest in a river. The small town locals ruled the death almost immediately as a suicide; but many have their doubts. This same day in Mexico ... three doctors were traveling to the State Capital in Mexico, to deliver some papers. They were reported missing that day. This portion of the article referenced one of the five "holistic health doctors" who was found dead, as well as three nameless doctors who went "missing" in Mexico in circumstances seemingly related to each another only by date. No information was provided about what readers were supposed to infer from this information. The deceased doctor to whom the author referred was James Jeffrey Bradstreet, a controversial figure found dead of a gunshot wound in a river in June 2015. Bradstreet, 61, was subject to a Food and Drug Administration (FDA) raid shortly before his death, which police said appeared to be suicide. As for the missing Mexican doctors, a 9 July 2015 article in the Daily Beast profiled their case and gave no indication that the individuals affected were in any way affiliated with alternative medicine or were on the radar of the FDA. In fact, there are no clear parallels between the deceased "holistic health doctors" included in the conspiracy theory and the missing Mexican doctors that we could find. I knew Bruce well for almost twenty years. I enjoyed chatting with him and throwing the discus. On Father's Day he was at the Sunshine State Games and felt dizzy throwing the discus and even fell once. He just didn’t look good acc. to other throwers, although his last throw was 133. He was given water and Gatorade, went to his car and passed away sitting there. He must have died of severe hydration, which may have led to a heart attack. We will surely miss him. [Holt's] unexpected death last month while on a trip to Jacksonville, Fla. has been a blow to his family and the community he'd created through his work. Though he had been struggling with recent health issues, none were thought to be life threatening by loved ones. His family is awaiting the results from an autopsy report<. "From where the vehicle is stuck there are many different directions he could go. He's actually stuck in what's called a pea field. It’s very difficult to walk through that that field was searched extensively by helicopter and you would have been able to see if someone walked through there. There's a two-track road that he drove in on and possibly walked out on," Lt. Greydanus said. June 29th, 2015 — The beloved holistic Theresa Sievers MD was found murdered in her home. Jeffrey Whiteside MD a pulmonologist went missing, vanishing when he simply "walked away." Dr. Whiteside, known for his successful treatment of lung cancer, disappeared in Door County, Wisconsin, while vacationing with family. They say he was on foot, and had no vehicle; and numerous reports call it "mysterious," saying he too, vanished without a trace. On 29 June 2015, Theresa Sievers was bludgeoned to death in her Florida home. An investigation into Sievers' murder remains open, and law enforcement officials have declined to comment on what they've found so far. But again, we were unable to turn up any evidence suggesting Sievers had an adversarial relationship with the FDA or any other large, powerful public health agencies before she was brutally murdered, and whoever killed her left a remarkable amount of evidence (incongruent with a calculated corporate hit). On 28 February 2016, 47-year-old Mark Sievers (Dr. Sievers' spouse) was arrested and charged with second-degree murder in what police alleged was a for-hire plot to cash in on several life-insurance policies. Lisa M. Riley, 34, was indeed a Doctor of Osteopathic Medicine and not an MD, but her field of practice was listed as the decidedly uncontroversial "emergency medicine." If Dr. Riley had cause to murderously enrage the medical establishment, that cause was well hidden. So while Bradstreet died of an apparently self-inflicted wound under increasing FDA heat (and following a recent raid), none of the other doctors subsequently tacked on to conspiracies regarding his death led similar lives. Of the four missing doctors, one was elderly and retired, and three vanished in Mexico (where they lived and worked). Dr. Holt's passing was a shock to many, but autopsy results are pending. Dr. Hedendal was 67 and passed away after a day of strenuous physical activity (presumably of natural causes). The murder of Dr. Sievers remains unsolved but was unlikely to have been carried out by high-level hitmen. Dr. Riley's husband (implicated in a similar shooting in 2010) was charged in connection with her suspicious death. Scott would not answer questions from reporters, saying the case was active and ongoing. He did not reveal the cause of death, manner of death or a possible motive, but he did say the case was the "most complicated, intricate set of circumstances that most of us have ever seen." those who deeply distrust medicine and science might take the list's assertions as plausible, but under the slightest scrutiny its claims disintegrate. Given the breadth of fields in which these individuals practiced (e.g., chiropracty, obstetrics, ophthalmology), millions of Americans could conceivably be counted among their ranks. Even if all the deaths and disappearances were suspicious (which most of them appeared not to be), five people out of millions is a very small percentage. The claims were not unlike the "Clinton Body Count" rumor, by which every dead person who had the slightest link to the Clintons was drafted into a broad, vague conspiracy theory. This rumor (like its predecessor) cherry-picked information that fit its narrative (such as timeframe) while discarding the facts that didn't fit (such as mainstream area of practice or later-explained circumstances/arrests). Update: On 23 July 2015 the web site Freedom Outpost published an article titled "Two More Doctors Found Dead — That Makes 7 in a Month," and on 24 July 2015 the Free Thought Project web site published an article titled "Another Florida Doctor Murdered, Bringing Total to 8 Dead & 5 Missing in Just the Last Month." Martin Martinez, 30, has been formally charged with killing his girlfriend's 2-year-old toddler last October. He was also a suspect in the Saturday homicides of girlfriend Dr. Amanda Crews, their 6-month-old daughter, her 6-year-old daughter, his mother and an unidentified 5-year-old girl. All of the deaths occurred in the homes Martinez shared with Crews, 38. Police haven't disclosed the cause of death for the five people killed in Modesto or discussed possible motives. Martinez isn't charged with their deaths, but police say he's their prime suspect. A lengthy profile published in People magazine about Dr. Crews' life and career detailed the circumstances of her family life and provided additional details about her death. Are these doctors' deaths all related somehow? The Crews death does seem strangely off, especially considering there is a suspect in custody and that he is also suspected of killing a child in October 2014. Other than that, it seems that doctors are facing a high rate of deaths, eerily similar to bankers in the past couple of years. The Free Thought Project also cited the July 2015 death of Dr. Norm Castellano, a Tampa-area dentist, among the list of "mysterious" doctor deaths. Castellano (again, not a "holistic doctor") died on 13 July 2015, and multiple Facebook posts published by grieving friends and patients indicated that his cause of death (while not publicly disclosed) was in no way suspicious or unexplained.